The plan my wife and I discussed was to have a row of dark red crepe myrtles along the fence that runs on the east side of our property. That would provide low maintenance long season color in that part of the yard. That discussion was weeks, even months, ago. We would see rows of crepe myrtles around town to observe the style they were pruned to and the spacing. Some are bare trunk trees and some are bushed up from the ground. We recently went to a hardware store to pick up some materials for a job, and they also sell plants and flowers. We decided to go see what was in the garden department. 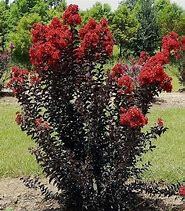 They had about 13 crepe myrtles that had dark red flowers and dark leafed foliage and beautiful, for $19.98 a pot. “Wow”, we said, “this is exactly what we are wanting.” They did not have a special sale price, they just had the tag on them $19.98. I asked the attendant if we bought 10 of them, would they give us a special deal. She said “Yes, I heard the manager offer someone 50% off. I can do that.” We took the deal and got $200 worth of plants for $100. Had I not asked, we would have paid full price. Jesus taught about prayer saying, “Ask, and it shall be given you…for every one that asketh receiveth.” Jesus said if you ask, it shall be given to you, not maybe, but it shall be given you. He said every one, not some, but every one that asks receives. He then went on to give the illustration that if a child asks a good father for bread to eat, he will not give that child a rock. If the child asks for some fish, a good father will not give him a snake. If the child asks for an egg, a good father will not give him a scorpion. Then Jesus gave the point of the lesson: If a good natural father gives good things to his hungry child, so much more will the heavenly Father give the Holy Spirit to his spiritually hungry children (Luke 11:9-13). God desires for every believer to have the power and the beauty of the supernatural operation of the Holy Spirit in his or her life all season long. It is the Holy Spirit who is given to magnify Jesus is our lives so that we live in his resurrection power on a daily basis. He is our Helper, our Comforter, and our Guide to go with us through every trial and every triumph of our life. In him is supernatural power for supernatural accomplishments. You can read about it in the Book. But you don’t have this unless you ask for it and expect to receive. That’s what Jesus taught. Believe and receive from Jesus.